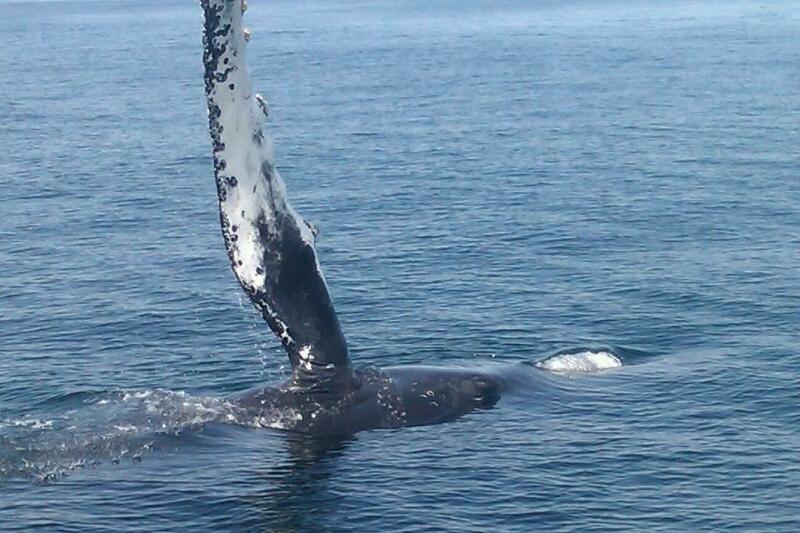 A juvenile humpback whale flipper slaps off Stellwagen Bank, MA. This marine sanctuary serves as a primary feeding ground for humpback whales and other marine life that call it home. 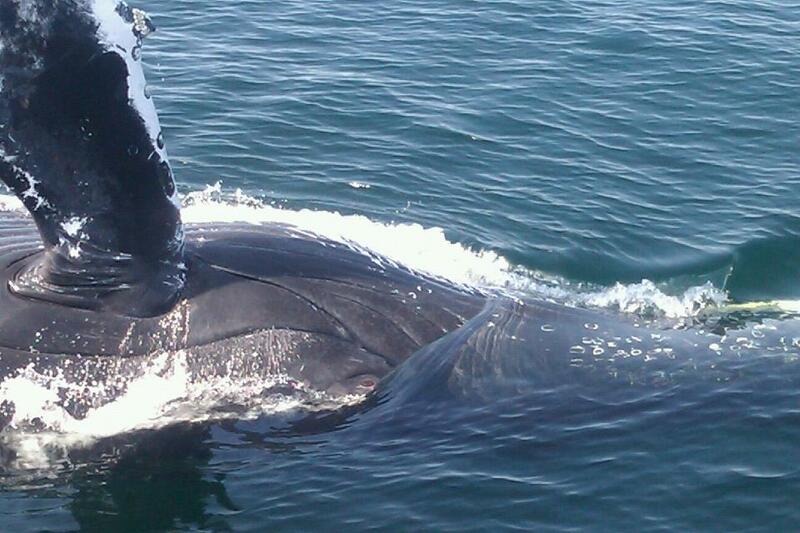 A few weeks ago, I went whale watching with my Dad off Glouchester, MA and it was such a great day for the both of us. We saw at least twelve humpback whales including two mother and calf pairs, four minke whales, and two grey seals off Stellwagen Bank, a marine sanctuary that is two miles off the coast of Cape Cod, MA. The marine sanctuary, which was established in 1992, serves as a safe haven for many marine animals such as whales, dolphins, propoises, seals, and sharks. Yet, when you visit this area, you are more likely to see humpback whales and grey seals more than you are with other animal species though but still, the sight of seeing these large mammals in their natural habitat will make you feel like that you part of a scene from a wildlife documentary even though there are movie cameras around to film the moment. 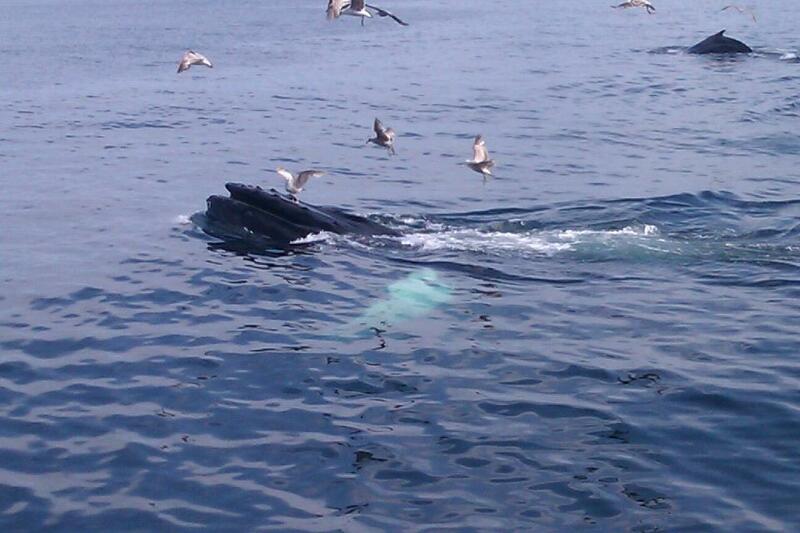 Humpback whale “Etch-a-Sketch feeds with a flock of sea gulls off the coast of Proviencetown, MA. During my whale watch, I got to see a varity of surface behaviors such as flipper slapping, tail striking, and even breaching. However, of all these behaviors, I saw the humpbacks whales feeding like crazy. For example, this one whale called “Etch-a-Sketch” did a tail flick right in front of the boat before he took a dive to create a bubble net and lunge feed at the surface with a flock of sea gulls joining him in the action and some of them “rode” on him as he continued to feed. It was such a sight to see and the krill and herring that the whales feed on is what drives these animals to Stellwagen during the spring and summer months while they migrate to waters off the Carribbean. While scientists don’t know why humpback whales display surface behaviors such as breaching or tail slapping, it’s believed that it could be a sign of either playing, being agressive, or just another form of communication. Just to make things intersting, we even saw one juvenile do nothing but flipper slapping the whole we have been in the area. When we first got to Stellwagen for the day, we were “greeted” by the sight of this animal doing nothing but flipper slapping as if he was welcoming us to the sanctuary even though he may have been either being playful or just trying to communicate with other whales that were nearby. Still, he was just so busy flipper slapping that the nautralists on boasrd had trouble figuring out who he was even though they were able to indentify him as being a juvenile whale. He would continue this behavior for several minutes before he decided that he was going take a nice long dive just so we could find other whales in the area. Going whale watching on Memorial Day was so much fun that I hope to go again next time when I have the chance to do so but I may have to wait until this coming fall for another round because that is when the whales start heading south for the winter.